(Fred Kabotie was born in Shungopori, AZ, c. 1900; d 28 Feb 1986). As a child he scratched images of kachinas (supernatural beings) on rocks in his father’s field. that he did so to relieve his loneliness and to remind him of home. 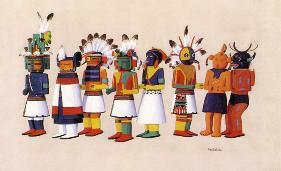 and emphasis on colour became distinctive features of later Hopi painting.